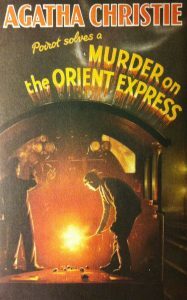 Agatha Christie’s Murder on the Orient Express is perhaps the most famous of Christie’s novels. In this book she introduces us to one of her many recurring characters, the sleuth and retired Belgian police officer Hercule Poirot. Poirot is fussy, short man with a prominent mustache which he takes great pains to groom. We are led to believe that Poirot’s intellect and powers of observation are of an order which exceeds common human abilities. In this, he takes his place with the likes of Sherlock Holmes and other great detectives of the late 19th and early 20th centuries. It is important to note that unlike contemporary heroes and detectives, particularly of the American detective novel genre, Poirot’s power comes entirely from his intellect. He never needs to resort of physical tactics to solve the crime. Through a combination of astute observation, reason, and logic Poirot is able to assemble the facts of his case and provide a complete explanation. In Murder on the Orient Express, Poirot is drawn into a mystery which involves everyone on board a train that has become stranded in the snow. There has been a murder, and the person guilty of it can only be someone on the train. He has nothing to go on other than scant clues and some rather dubious testimony of the passengers on the train. Nevertheless, he solves the crime. One of the main issues in Murder on the Orient Express is that Poirot, in the end, faces a legal and ethical dilemma. On this, we are left with the same information as Poirot. Christie does not draw conclusions for us and it is up to us as readers to decide what is the correct course of action given the circumstances of the plot. Christie reveals the crime and who committed the crime, but she does not direct us on how to deal with the crime.